Key hair stylist Marcos Diaz of ION Studio designed a tribal, pre-historic/Jurassic look that was still tangible and modern. 1. Diaz primed hair with Davines For Wizards No. 13 Mat Forming Ground, which made it easy to grip the hair when creating the braid (the next step) and it gave the hair a mat look. 2. 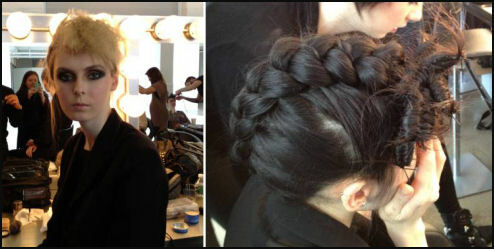 He created an inside-out braid (the reverse of a French braid) to the front of the hair line. 3. Then, he pinned the braid to the top of the head. 4. Using hair pins, he rick racked the front hair that was not braided, and flat ironed the pieces. 5. Allow the pieces to set to give the hair an accordion/zig-zag look. 6. Next, he removed the pins and teased the hair with a comb. 7. He finished by spraying with Davines Defining Invisible Hairspray. To counterbalance the defined, strong and sculpted lines of this season’s collection, we created a random, floating, ethereal texture,” said Peter Gray. “It’s multi-dimensional, very light and airy; the result of tightly wound curls fully brushed out and then encouraged to spring upward , outward and free in all directions. 1. First, Gray brushed hair out thoroughly. 2. He set out to create the fluffy texture using a random curling iron technique. Starting at the nape of the neck, he took small irregular sections in random directions, twisted them and then curled the hair. He alternated pencil thin 3/8″ and 1/2″ curling irons, continually rotating the sections at different angles and in as many different directions as possible. 3. He pinned each curl through its center with bobby pins to grip at the scalp. (They slide in and out of the hair easily and don’t damage strands). This ensured the curls stay close to the scalp and tight so that they spring out like a coil when they are released. 4. For a smooth, deep undulating wave in the front area that would nicely blend into hair’s fluffy texture, he created 3-4 sections using a 3/4” curling iron and made barrel curls, directing them towards the back. 5. Once hair was completely set, he sprayed Moroccanoil Luminous Hairspray Strong throughout, and used the Moroccanoil Ionic Ceramic Hairdryer with a diffuser sock attached to heat set them. After 5 minutes, they were literallyset like springs. 6. In some cases, depending upon the thickness of model’s hair, he created small bun sections at random parts of the head to ensure an even more irregular silhouette. 7. After unpinning the set, he completely brushed out the curls, starting at the back, so they would dramatically expand outwards and upwards. 8. Gray then pulled out random sections of hair, and then loosely backcombed and sprayed again with Moroccanoil Luminous Hairspray Strong once he formed the look. He used the heat of the hairdryer with a sock diffuser to fix and hold the shape. 9. To create the perfect wave in the front area, he combed and smoothed the hair, and shaped an undulating form with his fingers. 10. He then sprayed Moroccanoil Luminous Hairspray Strong to hold it in place and then blended the wave into the soft fluffy texture behind it, and sprayed again to fix the look in place. 1. Pita blow dried the hair using new Moroccanoil Luminous Hairspray Strong while lifting the hair at the root with a large round brush. 2. He then straightened the tips of the hair, and put the hairband around the neck, so he wouldn’t disturb the teased volume he would build later. 3. He began by backcombing the hair in ½ inch sections, starting at the nape of the neck and working his way to the front. 4. He sprayed each section that he teased with Moroccanoil Luminous Hairspray Strong since the foundation of the look had to last many hours. 5. Next, he brushed and smoothed out the top layers of the hair — very lightly since he didn’t want to take out any of the teasing — and sprayed again. 6. When he smoothed out the top layer, he made sure to brush more deeply at the front so it would go flat. He then took the headband around the neck and brought it up behind the ears so the front would stay flat, with the rest of the hair expanding out to create the look. 1. Calero first mixed a cocktail of Moroccanoil Treatment or Moroccanoil Treatment Light (depending upon the models’ hair texture and color,) with Moroccanoil Hydrating Styling Cream and worked it into dampened hair. 2. He then blow dried the hair straight using a large, round Moroccanoil Ionic Ceramic Brush, while lifting at the root to create volume on top of the head. 3. Next, he applied the new Moroccanoil volumizing mousse, (available exclusively in salons and spas in late Fall 2012,) through the top and sides and massaged it into the strands until they were saturated. This helped to create a glossy base to hold the waved patterning to come. 4. Then he finger-combed the hair at the top of the head to separate the strands and make fine curved patterns. This gave the appearance of contrast and depth. He also slicked the sides and repeated the patterning with my fingers. 5. While using the hair dryer, he lifted the soft waves at the root for more definition, and dried the pattern in place. Afterwards, he lifted the hair at the root – and then crisscrossed the raised strands at the crown for a bit more height and volume. 6. Calero then sprayed Moroccanoil Luminous Hairspray Strong throughout the style to hold it in place and leave it natural-looking and shiny. 7. To give hair at the back of the head a more linear look and emphasize its contrasting texture and finish, he flat ironed each section to smooth the hair from the crown down and to eliminate any flyaways. 8. He misted on Moroccanoil Glimmer Shine Spray after flat ironing to give sleeked hair a beautiful mirror-like shine, and then misted the entire style with Moroccanoil Glimmer Shine Spray to unify the two finishes. The inspiration of the hair was that of an uptown girl who is kind of nerdy, and wants to go downtown to try to be cool. She knows all of the elements that make the cool downtown look, but something just isn’t quite right. ION Studio’s Marcos Diaz decided to keep the look up for some of the girls while for others (after the look set) he took it down and let it hang over the shoulder. 1. Diaz sprayed the hair with Davines Defining Texturizer and blew it out using ONE Styling’s NEW Epic Dryer set to a negative charge; negative ions neutralize the charge, closing the hair follicles and smoothing the shaft to create a smooth look. 2. Next, he created a deep side part and secured it with a rubber band behind the ear. 3. He then secured the front bangs with a bobby pin. 4. Using a 1″ Curling Iron, he created imperfect waves in the hair. 5. He then took both sections and created a side bun just behind the ear and pinned it. 6. Diaz sprayed hair with Davines Defining Invisible Hairspray. 7. He then finished with a thin coat of Davines OI/OIL for added shine. 1. To create the look, Turnbow wanted to keep the skin raw and clean so the eyes and lips were the focal point of the face. She prepped the skin with moisturizer to create luminosity. 2. She then applied the NYX Cosmetic’s Stay Matte but not Flat Powder Foundation to combat t-zone shine. 3. 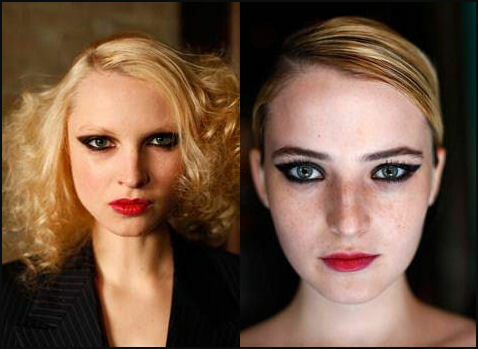 She then focused on the eyes which were inspired by Helmut Newton and Debbie Harry in the early ’70s using various shades of brown for a bold, yet feminine look. She began by creating a deep V on the outer-corner of the eye using the NYX Cosmetics Jumbo Eye Pencil in Chocolate. 4. Using her finger, she then blended the NYX Cosmetics Cream Shadow in Chocolate and Suede to frame the middle of the eye and create dimension and shine. 5. To brighten and give the eye luminosity, she applied the NYX Cosmetics Jumbo Eye Pencil in French Fries to the inside crease and lower rim. 6. Turnbow then rimmed the eyes using the NYX Cosmetics Collection Noir Kohl Kajal Black Liner and applied two coats of the NYX Cosmetics’ Boudoir Mascara Collection in La Amoureux to the lashes. 7. For the lips, she wanted to create a unique take on the bold lip. She combined the NYX Cosmetics Retractable Lip Liner in Plum with the NYX Cosmetics Matte Lipstick in Alabama to give a matte, two-toned effect. The edges were then blurred to really complete the modern 70’s look of the face. 8. She then finished by contouring the cheeks with darker shades of the NYX Cosmetics Stay Matte but not Flat Powder Foundation. The completed look was glam, yet fabulously feminine. Hair stylist Cesar Ramirez drew upon Gallagher’s “Silent Soil” idea. “The look for the season is all about this organic woman, almost in an isolated Norse feminine world, and all her self-expression and power comes from her connection to the earth.” Ramirez created shapes reminiscent of the forms found in the woods. 1. Ramirez started by spritzing hair with Davines Defining Texturizer. 2. He then blow dried to create volume and part a horseshoe section at the top of your head. 3. He brushed the rest of the hair to the back of the head and pinned it with bobbie pins, twisting and pinning the hair down like a vertical twist bun. 4. Ramirez teased the root of the hair at the horseshoe section. 5. At the front hairline, he created about 4 sub-sections, bent the hair, and pinned it down. He left the remaining hair in one section and bent and pinned it. 6. Once all of the hair was pinned down, he sprayed with Davines Defining Invisible Hairspray and pulled at the hair slightly to create a messy fly away texture. Elettra Wiedemann, model, philanthropist, and face of Lancôme, was the muse for the makeup for Chiang’s show. “She’s such a natural beauty and has this really healthy glow about her,” said Chiang. “She can also effortlessly transform from girl next door to old Hollywood glamour girl or rocker chick, to suit her mood. I chose her not only because she’s beautiful, but because she’s strong, smart and stands for something.” Lancôme National Makeup Artist Tarek Abbas, who created the looks wanted the models’ skin to be flawless with a healthy glow. 1. Abbas contoured the cheeks using the new Blush Subtil Palette and swept bronzer around the hairline and chin. 2. He mixed two neutral shades of Color Design Eyeshadow to create a subtle wash of color around the eyes and defined the eyes with dark brown eyeliner, which was carefully smudged and blended. 3. He then used one coat of Définicils Mascara in Brown to createe natural-looking lashes. 4. Finally, he applied Rouge In Love in Lasting Kiss with his finger and pressed the color onto the lips to pump up the model’s natural lip color. The collection was inspired by the internal revolution channeling the spirits of Jim Morrison, Aldous Huxley, and William Blake. Poetic and rock-n-roll, the collection is fueled by a quest for knowledge and heightened consciousness. Hairstylist Marcel Dagenais wanted continuity and so he gave all of the girls the same texture and style for a look that was classic with a contemporary texture. 1. Dagenais sprayed Davines VOLU Mist at the roots of the hair and blow dried it straight out with a flat Denman Brush. 2. Next, he wrapped a 2″ subsection of the hair around the hairline with jumbo sized hair pins to create a frizzy dry texture. 3. He then sprayed Davines For Wizards No. 9 Structuring Mist on the hair and then set with a flat iron. 4. Dagenais brushed hair and put all of it into a low, messy bun. 5. He finished by spray Davines For Wizards No. 7 Crystal Fixative Lacquer for hold. This is so great! I really like how you put all the looks in one story instead of having so many different stories. It’s so much easier for me to find, of course I’ve bookmarked this anyway. They Hyden Yoo and Chiang hair is do-able but the others not so much in real life. I guess that’s what the runway’s for. I’m going to try the bun from the Hyden Yoo show. So cute!